When we are overwhelmed by emotions, the best thing we can do is… feel them. What? Wait a minute. That advice seems counterintuitive. The obvious answer is that if you want to stop experiencing something, you should do everything you can to avoid it. Right? It turns out that most of what we’ve been taught about “bad” emotions is not very helpful. “Feeling bad” may be uncomfortable, but no emotion is good or bad. What’s more, the only way out of unpleasant emotions is to go inward and experience them. Pushing emotions down or away just doesn’t work. The emotions have to go somewhere, so feelings that you ignore haven’t actually disappeared—they’re just in the background. The other problem is that when you shove your “bad” feelings into a dark corner, all of the other feelings get shoved away as well. Muting one emotion means turning down the volume on feeling anything at all. If you don’t allow yourself to feel grief, then how will you feel joy? Think of it as expanding your capacity to feel it all, including the pleasant and unpleasant emotions. When you welcome emotions rather than rejecting them, you become the ocean that can hold all the different waves—the riptides as well as the calm moments. You want to be the ocean that can be with it all, rather than getting caught up in each individual wave. This is where mindfulness comes in. Can you access that part of yourself that stands back and watches it all? Use the DBT skills of Observe and Describe to ride out the different emotional waves that move through you. What’s the point of accepting all emotions? Learning to allow your emotions to rise and move through you is like building strength in a neglected muscle. With practice, you learn to trust that you can experience whatever feeling is coming up and it won’t kill you. You build the muscle of knowing you can safely be with whatever emotion arises. On the other hand, if you tend to push emotions down, you will continue to be scared of them… and in that way, they kind of rule your life. Often the primary emotion feels painful. But there is a secondary emotion, too, which can be equally distressing: how you feel about the emotion. For example, if you’re grieving over the loss of a relationship, you may fear feeling the pain of grief. Perhaps you are terrified that if you let yourself feel this emotion, you will never come out of it. Or you may feel anger or shame around the fact that you feel sad. Your emotions about your emotions, especially if they are tinged with judgments, often make you feel worse. 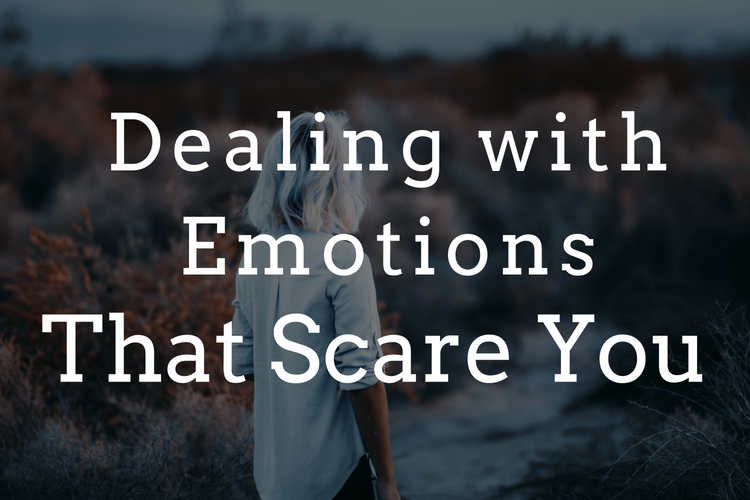 These secondary emotions muddy the waters a lot and can lead to confusion about what’s going on. Letting feelings move through you with mindfulness helps decrease the sense that your emotions control you. When you allow emotions to move through like a wave, you are not at their mercy anymore. There is a you who can feel them, not act on them, and you become an ocean that is able to contain it all. There is great freedom in this approach. The way many of us have been taught to deal with emotion creates suffering because we experience the pain of the primary emotion as well as the pain of resistance. With mindfulness, experiencing pain with acceptance instead of resistance can lead to emotional freedom and peace. Emotional pain is simply part of being human. Many of us came from a family or culture where emotions were viewed as not okay. We were taught to “keep a stiff upper lip” or to keep our emotions in check—in other words, to stuff them down and ignore them. But there is no way to get rid of painful emotions. Difficult feelings are just part of the human condition. Instead, we can let go of the suffering we create for ourselves so that we simply feel what we feel, and then move on. Do you want help with your emotions? Contact us at our San Francisco counseling practice 415-310-5142 to see how therapy can help you feel better more often. We offer individual therapy, couples counseling, and DBT.